What was the Florida Supreme Court’s role in enforcing federal Civil Rights legislation? Virgil Hawkins, a professor at Bethune Cookman College, decided to apply for admission to the University of Florida’s College of Law in 1949. The University rejected his application because he was Black. Hawkins appealed and the case reached the Florida Supreme Court the following year. 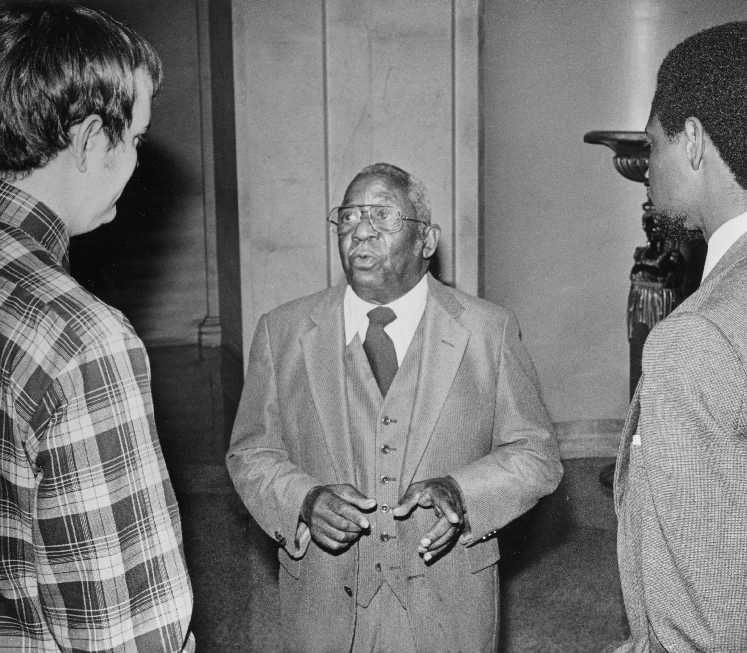 The Court denied his appeal based on the grounds that although it was not open when he first applied, the state had subsequently launched a new law school for African Americans at Florida A&M College. They declared his case moot. Hawkins continued to appeal his case for the next several years, winning at the federal level but losing at the Florida Supreme Court. He agreed in 1958 to withdraw his admissions application in exchange for the promise that the University of Florida’s law school would be desegregated for all others. All photographs on this page are courtesy of the Florida State Archives. The African American Experience and the Florida Supreme Court Since Brown is a history of African American experience in relation to the Florida Supreme Court since Brown v. Board of Education (1954). This project asks: How have African Americans been impacted by the Court’s decisions? What has been their role as litigants? What have been their encounters as lawyers presenting to the court? What have been their experiences as Justices? How have African Americans worked as supporting staff? How have rights developed in the course of the court’s history/jurisprudence? This project focuses on cases, lawyers, and judges to provide answers to these questions and demonstrates the role of the Florida Supreme Court in shaping today’s society. In constructing a history of these diverse experiences, this project makes use of textual documents from the Florida State Archives, photographs, and oral histories. The final report has served as the material basis for the production of a small traveling exhibit and permanent exhibit at the Court. Justice Joseph W. Hatchett each recalled the same story. They arrived at the hotel where they were supposed to take the test, went in, and sat down. Just moments before it was to begin, however, one of the proctors came over and told them and the other four African Americans candidates that they would have to leave the room. The proctor did not allow them to take the exam in the same space as their white peers because the hotel had a policy of segregation. Justice Shaw remembered that several of the black students left and never returned to take the Bar. While this proctor upheld this mid-twentieth century legal and social practice of racial discrimination, this was not always what African Americans experienced in relation to the Florida Supreme Court. After earning his Juris Doctor from Howard School of Law, Justice Shaw was hired to teach law at Florida A&M University. After a few years, Shaw was admitted to the state Bar and set up practice in Jacksonville. What he experienced next, he had not anticipated. The clerk of a local court would not accept his pleadings. If he could not file the papers, he could not practice law. Uncertain what to do, Shaw found a payphone and called the clerk of the Florida Supreme Court and explained the situation. He was put on hold. After a few minutes Justice James C. Adkins Jr. picked up the line and listened to Shaw recount his dilemma. After a pause Adkins told Shaw that he could not discuss the situation because it might eventually become a case before the court. However, Adkins told Shaw to hang up, wait five minutes, and then try to refile the papers. This time the pleadings were accepted and filed. Shaw went on to serve with Justice Adkins. These two moving stories serve as examples of the powerful role of the Florida Supreme Court and its judicial officers in the lives of the residents of Florida. It tells us about the importance of the judicial process and the use of the law to fight for social justice. It also tells us about the complicated history of racial injustice that functioned and was fought at an institutional and personal level. The story shows that everyday experiences with the law matter. Knowing this history enriches our understanding of the past and inspires our sense of civics in the present. “The African American Experience and the Florida Supreme Court Since Brown,” documents these important stories. This research project was sponsored by the Florida Supreme Court Historical Society in collaboration with the History Department of Florida State University. Underwritten By Carlton Fields, P.A. with contributions by Miles McGrane, Susan and Stanley Rosenblatt, Herman Russomanno, Sheldon Schlesinger, Sylvia and Dan Walbolt, and The Florida Supreme Court Historical Society.